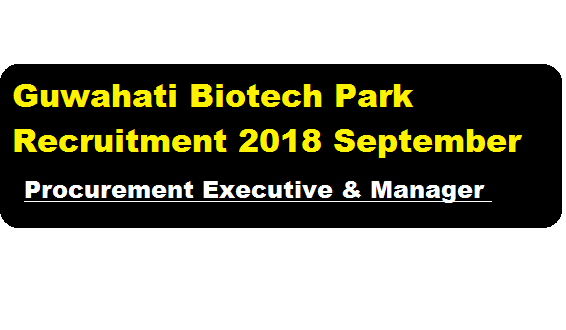 Guwahati Biotech Park Recruitment 2018 September Procurement Executive & Manager posts :- Guwahati Biotech Park [GBP] is a visionary project launched by an autonomous society under the Government of Assam which aims to change the economic condition of the region and the state by increasing the opportunities for the citizens of North Eastern and Eastern India. In a recent Recruitment notification for the month of September, Guwahati Biotech Park invites applications for filling up of the following positions by direct recruitment on contractual basis. We have discussed about the posts in the below section. In this section, we will discuss in detail about Recruitment of various posts under Guwahati Biotech Park Recruitment 2018 September with all the details and requirement. Educational Qualification: Candidates must be Graduate/Post Graduate (Full Time) from any Government recognized University in any subject with in depth knowledge and understanding of public procurement principles and procedures. Experience: Minimum 4 years of experience in supporting procurement related functions in any Government /Autonomous Body /Public Sector Undertaking or agencies /Reputed Private Sector organizations. Age Limit: The candidate shall not be more than 45 years of age as on 01/08/2018. Educational Qualification: Candidates must be M Sc/ M Tech in life sciences/ biotechnology/ Pharma from a recognized Board/University/Institute. Experience: Minimum 4 years of experience in entrepreneurship development and incubation activities in any Government/Autonomous Body/Public Sector Undertaking or agencies/Reputed Private Sector organizations. Age Limit : The candidate shall not be more than 45 years of age as on 01/08/2018. Eligible & Interested and eligible candidates may sent the application in prescribed format to careers@guwahatibiotechpark.com within 15 days [from 30th September 2018]. Shortlisted candidates will be communicated through email only.Further clarification/corrigendum in this regard, if any, will be uploaded only on GBP website. GBP reserves the right to reject any or all the applications without assigning any reasons thereof.